Not to be confused with Andrés Iniestra. This name uses Spanish naming customs: the first or paternal family name is Iniesta and the second or maternal family name is Luján. Andrés Iniesta Luján (Spanish pronunciation: [anˈdɾes iˈnjesta luˈxan]; born 11 May 1984) is a Spanish professional footballer who plays as a central midfielder for Japanese club Vissel Kobe. He spent most of his career at Barcelona, where he served as the captain for three seasons. Iniesta came through La Masia, the Barcelona youth academy, after an early migration from his birthplace, and impressed from an early age. He made his first-team debut aged 18 in 2002. He began playing regularly during the 2004–05 season and remained in the team until 2018. Iniesta was an integral part of the Barcelona sides that won two historic trebles in 2009 and 2015, and his 33 trophies, which includes nine La Ligas and four UEFA Champions League titles, make him the most decorated Spanish footballer of all time. Iniesta played for Spain at the Under-16, Under-19 and Under-21 levels before making his international debut in 2006. He helped Spain win Euro 2008, playing every game and being selected in the Team of the Tournament. Iniesta was also a key member of the victorious Spanish team at the 2010 World Cup; he scored the winning goal in the final against the Netherlands, for which he was named the Man of the Match, and was selected to the tournament's All-Star Team. 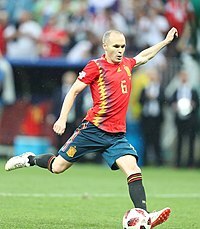 At Euro 2012, Iniesta led Spain to their second consecutive continental crown, again being chosen as the Man of the Match of the final against Italy, and was named the Player of the Tournament. Iniesta is widely considered to be one of the best players of his generation and one of the greatest midfielders of all time. Since 2009, he has been named in the FIFA World XI nine times and was chosen in the UEFA Team of the Year on six occasions. Iniesta won the UEFA Best Player in Europe Award in 2012 and was named the IFFHS World's Best Playmaker in 2012 and 2013. He was runner-up to Lionel Messi for the 2010 FIFA Ballon d'Or and achieved third place in 2012. Iniesta comes from Fuentealbilla, a small village in the province of Albacete, Castile–La Mancha, Spain. At the age of 12, while playing for Albacete Balompié in a junior seven-a-side tournament in Albacete, he attracted the attention of scouts from clubs around Spain. His parents knew Barcelona's youth team coach, Enrique Orizaola, and he persuaded them to consider sending Iniesta to the Barcelona youth academy. Iniesta traveled there with his parents and visited La Masia, the farmhouse where the club houses its young players; the trip convinced them to enroll Iniesta in the Barcelona youth ranks. "Receive, pass, offer, receive, pass, offer." Iniesta says he "cried rivers" the day he left for La Masia and struggled being separated from his parents; he was very shy and kept to himself while there. He captained the Barcelona Under-15 team to victory in the Nike Premier Cup of 1999, scoring the winning goal in the last minute of the final, and was named player of the tournament. Just after Iniesta arrived at the club, then-captain Pep Guardiola famously told fellow midfielder Xavi: "You're going to retire me. This lad [Iniesta] is going to retire us all." Iniesta with Barcelona in 2006. In the 2004–05 season, Iniesta featured in 37 out of 38 league games—more than any other player—although 25 of these were substitute appearances. He scored twice as Barcelona won La Liga. An injury to Xavi at the start of the 2005–06 season allowed Iniesta more regular starts in the centre of midfield, and he continued to improve and develop. He played in 11 UEFA Champions League games, including a half-time appearance in the 2006 final, to replace Edmílson. His contribution to the team was praised by manager Frank Rijkaard as Barcelona won a league and Champions League double. The 2006–07 season saw Iniesta's profile continue to rise and he earned plaudits for his willingness to play in any position for his team. In the pre-season, he lifted the Joan Gamper Trophy as the captain of the team after a 4–0 victory over German side Bayern Munich. Iniesta played for the first time as a left wing-forward for Barça in two Champions League matches against Levski Sofia, finding the net twice. In the first knockout stage of the same competition, he played in central midfield against Liverpool. 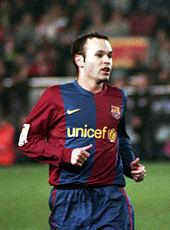 Despite being moved around the pitch by manager Rijkaard, the 2006–07 season remains Iniesta's highest scoring thus far. With the departure of Ludovic Giuly ahead of the 2007–08 campaign, Iniesta was able to switch his number 24 shirt for his preferred number 8. Despite rumours of a possible transfer before the season, he extended his contract to 2014 on 25 January 2008, with his buy-out clause being raised to €150 million. Don Balón, a member of European Sports Magazines, named Iniesta one of the most consistent performers in the previous two seasons of La Liga; he placed fifth in 2006–07 and fourth in 2007–08. He also placed ninth in the 2008 FIFA World Player of the Year voting, gaining 37 total points. At the start of the 2008–09 season, in September 2008, Iniesta was elected the fourth-choice captain behind, in order of preference, Carles Puyol, Xavi and Víctor Valdés; all four were products of the Barcelona youth system. His performances throughout the season were highly lauded, and he received standing ovations both in Barcelona at the Camp Nou, as well as from rival supporters in away matches. A leg injury sustained in mid-November 2008 left Iniesta sidelined until 3 January; initially expected to return to action in six weeks, he did not want to come back until he was 100 percent. Upon his return to action, as a 65th-minute substitute against Mallorca, he scored a crucial goal after just ten minutes on the pitch and completed a Barcelona comeback in front of the Camp Nou. Iniesta sustained another injury during a home match against Málaga, but returned to action for the first leg Champions League quarter-final against Bayern Munich, which Barcelona won 4–0. He scored a vital equaliser in the final minute of stoppage time during the second leg of the Champions League semi-final against Chelsea, with a curling strike with the outside of his right foot 25 yards from goal, securing the tie on away goals as the match finished 1–1. In the season review, Un Any Al Paradis, Iniesta wrote, "I connected with that shot with the outside, not the inside or the tip of my boot, but right from my heart, with all my might." "I knew I would play injured and do more damage. For 17 days, all I thought about was the final in Rome and winning, even knowing that I would do more damage. I'd repeat it, for sure. I love this club and my profession and I wanted to win. If we had lost the final that would have been a total disaster." Iniesta's goal against Chelsea sent Barcelona through to the final in Rome against defending champions Manchester United. Prior to the final, United manager Alex Ferguson identified Iniesta as Barça's biggest threat: "He's fantastic. He makes the team work. The way he finds passes, his movement and ability to create space is incredible. He's so important for Barcelona." Despite a thigh injury, Iniesta played and was influential in the game, providing the assist for the first goal scored by Samuel Eto'o as his team went on to win 2–0. In his analysis, David Pleat wrote, "In the end the midfield artistry of Iniesta and Xavi, helped by [Lionel] Messi, was the critical factor." After the game, United striker Wayne Rooney described Iniesta as the best player in the world. Iniesta received plaudits for his performances that season; Don Balón rated him as the league's most consistent performer. Later that year, he placed fifth for the 2009 FIFA World Player of the Year award, with 134 votes, and fourth for the Ballon d'Or, receiving 149 points. Barcelona extended his contract by one year, until 2015, and raised his buy-out clause to €200 million. Barcelona won a second successive league title in the 2009–10 season, securing a record 99 points. Individually, however, Iniesta endured a campaign largely disrupted by recurring injuries. He missed pre-season fitness training due to the thigh tear suffered in the 2009 Champions League final. Despite featuring in almost as many matches as the previous season, he did so mostly as a substitute, starting only 20 games throughout. His season came to a premature end in April after he aggravated a previous calf injury during training. Iniesta playing against Rubin Kazan in the UEFA Champions League, October 2009. A contributing factor of Iniesta's fractured season were the episodes of psychological instability he suffered privately following the death of his close friend Daniel Jarque, a fellow footballer, in August 2009. Even when physically fit, he was often unable to complete training sessions or exert himself. After seeking psychological help, he experienced catharsis when he scored Spain's match-winning goal in the 2010 FIFA World Cup final, which he dedicated to Jarque by revealing the message "Dani Jarque, always with us" written on his undershirt. "I did it because I felt it deeply," Iniesta said at the time. "It showed that what is more important than rivalry, your team or your colours is to be human and a good person. I am delighted because it was the most important moment in my career." Regarding the recurrent injuries that plagued his season, he said, "It was hard, but I will start with more desire than ever." Iniesta scored his first goal of the 2010–11 season during the opening league fixture against Racing de Santander, lobbing the ball into the net from a distance of 30 yards. Throughout the campaign, he received standing ovations from opposition fans, including at El Sardinero and the Vicente Calderón Stadium, in appreciation of his World Cup-winning goal. Another standing ovation came on the home pitch of Espanyol in the Derbi barceloní, with the crowd acknowledging his friendship with Daniel Jarque, Espanyol's captain at the time of his death. Iniesta was one of the three finalists for the 2010 FIFA Ballon d'Or alongside Xavi and Messi, placing as runner-up behind the Argentine. Iniesta started the 2011–12 season by scoring the opening goal in the second leg of the Supercopa de España against rivals Real Madrid. Barcelona went on to win the match 3–2 and the cup 5–4 on aggregate. One of his best goals followed in October against Viktoria Plzeň in the Champions League group stage after an interchange of passes with Messi. Iniesta played a record 51 matches unbeaten in La Liga, concluding with Barcelona's 2–0 defeat of Mallorca on 24 March. In the Champions League, he ended a goal drought by scoring a vital goal against Milan in the quarter-finals. From there, he went on to score in the semi-final against Chelsea to make the scoreline 2–0, but the match ended 2–2, eliminating his team 3–2 on aggregate. Towards the end of the year, on 25 November, Iniesta was named man of the match after scoring one goal and providing three assists in a 4–0 win over Levante. His performances earned him third place in the voting of the 2012 FIFA Ballon d'Or. Iniesta lifting the 2015 UEFA Super Cup trophy. Iniesta signed a new contract with Barcelona in December 2013, keeping him at the club until 2018. As vice-captain, he regularly captained Barça throughout the club's second treble-winning campaign of the 2014–15 season, and became captain after Carles Puyol's retirement and Xavi's departure. Iniesta scored three times during the team's Copa del Rey campaign, and was man of the match in the 2015 UEFA Champions League Final, having assisted Ivan Rakitić's opening goal in the 3–1 defeat of Italian champions Juventus at Berlin's Olympiastadion. Their European victory made Barcelona the first club in history to win the treble of domestic league, domestic cup and European Cup twice; Iniesta was among the seven players to have been a part of both treble-winning teams. During the first Clásico of the 2015–16 season, on 21 November, Iniesta became only the third Barcelona player, after Diego Maradona in 1983 and Ronaldinho in 2005, to receive applause from Real Madrid fans at the Santiago Bernabéu. His man-of-the-match performance included a goal and an assist, contributing to a resounding 4–0 victory. He signed a lifetime contract with Barcelona on 6 October 2017, effectively keeping him with the club for the remainder of his career. He played the 650th game of his career for Barcelona against Levante on 7 January 2018, he was replaced by André Gomes after 76 minutes as the game ended 3–0 in favour of Barcelona. Despite signing a lifetime contract, on 27 April 2018, Iniesta announced he would be leaving Barcelona by the end of the season. He made his 674th and final appearance for Barcelona on 20 May, in the final league match of the season, a 1–0 home victory over Real Sociedad, as Barcelona celebrated the victory of their 25th league and 30th Copa del Rey title; he came off in the 81st minute for Paco Alcácer. On 24 May 2018, Japanese club Vissel Kobe announced the signing of Iniesta on a three-year deal. He made his debut on 22 July, coming on as a second-half substitute for Kazuma Watanabe in a 0–3 defeat against Shonan Bellmare. Iniesta burst on to the international scene in 2001, helping Spain win the UEFA European Under-16 Championship. After representing his country at the 2001 FIFA U-17 World Championship held in Trinidad and Tobago, he was in the squad that claimed the UEFA European Under-19 Championship the following year. From then, he became a regular choice for youth coach Juan Santisteban. In 2003, he was part of the side that reached the FIFA World Youth Championship final in the United Arab Emirates, and was named in the FIFA all-star team. During his spell with the Spain U21 side, Iniesta was named captain on several occasions. Iniesta was called up to represent the senior Spain squad at the 2006 FIFA World Cup on 15 May 2006, much to the surprise of many. He won his first cap for La Furia Roja when he was brought on at half-time in a friendly against Russia on 27 May. His first goal followed in a friendly against England on 7 February 2007. His long-range effort, hitting the underside of the crossbar on the way in, gave Spain the lead on 63 minutes. Iniesta played a pivotal part in Spain's qualification for UEFA Euro 2008 by scoring goals against Sweden and by assisting the strikers. Iniesta playing for Spain in September 2013. Iniesta was selected in Spain's squad for UEFA Euro 2008 in Austria and Switzerland. Though a stomach ailment somewhat hampered his performances in the group stages, he still played an integral part in the midfield. He played in the first two of Spain's group stage matches and proved an important part of the team, providing a pass for David Villa's second goal against Russia. He was not rested, unlike most of Spain's regulars, for the final group game against Greece, which Spain won 2–1 thanks to a volley from Rubén de la Red and a late winner from Daniel Güiza. Iniesta returned for the quarter-final as Spain beat Italy on penalties; he was substituted before the penalty shootout itself. In the semi-final against Russia, he played the entire 90 minutes and produced a cross that Xavi converted to open the scoring; he was subsequently named the Man of the Match. He played the duration of the final in Spain's 1–0 win over Germany. Iniesta was named in the Team of the Tournament alongside fellow Spain midfielders Xavi, Marcos Senna and six other teammates. Iniesta did not participate in the 2009 FIFA Confederations Cup in South Africa due to a thigh muscle injury; Spain was eliminated from the tournament at the semi-final stage. Iniesta was selected for Spain in the 2010 World Cup and scored the second goal in a 2–1 group stage win against Chile. He was also named man of the match. For his excellent performances in helping Spain reach the final of the tournament, Iniesta was shortlisted for the Golden Ball award. During the final, he scored the winning goal in the 116th minute of a 1–0 win against Netherlands. He earned a yellow card for removing his jersey during his ecstatic goal celebration to reveal his message to his late friend Dani Jarque. He won the man of the match award for his performance in the final, which gave Spain its first-ever World Cup. At UEFA Euro 2012, Iniesta was awarded the man of the match award for his performances in three different matches. He was also selected as man of the match in the final against Italy, which Spain won 4–0. In winning the award, Iniesta became the only Spanish player to win the award at least once in each of Spain's three consecutive successful tournaments. Iniesta was also chosen as the UEFA Euro 2012 Player of the Tournament. At the 2013 FIFA Confederations Cup, Iniesta was named in the Team of the Tournament and awarded the Silver Ball for the second best player in the competition, as Spain finished runner-up to host nation Brazil. Iniesta started all three matches for Spain at the 2014 World Cup, winning his 100th cap in the team's final group match against Australia. At the UEFA Euro 2016, he assisted the only goal of the match against Czech Republic and put in a man of the match display to give Spain a winning start in the tournament. He started in all four Spain's matches and were later knocked out by Italy in the Round of 16. In May 2018, Iniesta was named in Spain's squad for the 2018 FIFA World Cup in Russia. He started in all three matches of the group stage, making an assist for Isco in the 2–2 draw against Morocco on 25 June 2018. He came off the bench in the 67th minute in Spain's last match at the tournament against Russia on 1 July 2018 for the round of 16. After the loss in the penalty shoot-outs, Iniesta announced his retirement from international duty. He amassed 131 senior international caps for Spain and at the time of retiring was the nation's fourth-most-capped player of all-time, behind only Iker Casillas, Xavi, and Sergio Ramos. Like fellow La Masia graduate Cesc Fàbregas, Iniesta originally started as a defensive midfielder, but his balance, ball control and agility allied with his skill and flair on the ball saw him make progress as an attacking midfielder. Beyond his raw talent that was spotted at a young age by Barcelona's scouts, it was his great versatility, work ethic and inventiveness that allowed him to stake a claim on a first-team place at the age of 18. Vicente del Bosque described him as "A complete footballer. He can attack and defend, he creates and scores," and Frank Rijkaard said, "I played him as a false winger, central midfielder, deep midfielder and just behind the striker and he was always excellent." He was used initially as a wide-forward in the absence of Juan Román Riquelme and Ronaldinho by Louis van Gaal and Rijkaard respectively, but made his name as a world-class player in central midfield alongside or in lieu of Xavi, at both club and international level. As FIFA.com says, "It is in this position that his direct style and quick feet can be used to full effect, with the ball seeming glued to his toes as he races into threatening positions. Iniesta is a player known for his passing, dribbling, vision and movement." His signature move is La Croqueta – a move pioneered by Michael Laudrup and popularised by Iniesta – where he quickly pushes the ball from his right foot to his left which takes the ball away from an opponent, allowing him to get out of a tight situation. "The one who plays this game the best is Iniesta: he knows exactly when to go forward and when to drop back. He picks the right moment to do everything: when to dribble, when to speed things up and when to slow things down. And I think that's the only thing that can't be taught or bought. You can learn how to shoot and how to control the ball, but being aware of everything that's happening out on the pitch – that's something you're either born with or you're not." Much like other Barcelona youth products such as Pep Guardiola, Xavi and Iván de la Peña, Iniesta is a playmaker who relies on exceptional creative passing, intuition and inventiveness to control the midfield and dictate the ebb and flow of play. Iniesta has been praised for his understanding and interplay with Xavi; former Barcelona teammate Giovanni van Bronckhorst said of the pair, "They have a special relationship, they always have, they just seem to know where the other one is." During his maturation as a player, he has gained a reputation for playing a part in important goals for club and country, specifically playing a leading role in the 2006, 2009, 2011 and 2015 UEFA Champions League finals, as well as the 2010 World Cup Final, Euro 2012 final and Euro 2008 semi-final. His willingness to play anywhere on the pitch has earned him the sobriquet El Ilusionista (The Illusionist), El Cerebro (The Brain), El Anti-Galáctico (a pun on Real Madrid players' nickname Los Galácticos), El Caballero Pálido (The Pale Knight) and most recently Don Andrés from the Spanish press. Zinedine Zidane also praised Iniesta, stating on the Spanish radio station Cadena COPE, "Iniesta really impresses me. He's got so much influence in Spain's game. He reminds me of myself." Fernando Torres, Spain's striker, said, "We've been playing together since we were 15 and I have never, ever seen him play badly." He is widely regarded as one of the most respected and best midfielders of all time. Iniesta has a sponsorship deal with sportswear company Nike, and has appeared in Nike commercials alongside Cristiano Ronaldo, Neymar, Zlatan Ibrahimović and Wayne Rooney. Iniesta features in EA Sports' FIFA video game series, and was the sixth-highest rated player in FIFA 15. Iniesta’s signature move, La Croqueta, features in FIFA 19. In March 2015, Iniesta had the ninth highest social media rank in the world among sportspeople, with 24 million Facebook fans. Iniesta is married to Anna Ortiz; the couple began dating in 2008 and wed on 8 July 2012. They have two daughters, Valeria (born April 2011) and Siena (born May 2017), and a son, Paolo Andrea (born May 2015). They lost an unborn child, son Andrés Jr., due to miscarriage in March 2014. Iniesta is a Catholic. In 2011, Iniesta invested €420,000 in his boyhood club, Albacete, thus becoming its major shareholder. Two years later, with the club facing administrative relegation to the fourth tier of Spanish football, he loaned them a further €240,000 to cover unpaid wages. In May 2018, Iniesta revealed to Risto Mejide that he suffered from depression before the 2010 FIFA World Cup due to his injuries and the death of Daniel Jarque. Scores and results list Spain's goal tally first, score column indicates score after each Iniesta goal. Iniesta (second from the left) and his teammates celebrate winning the 2011 FIFA Club World Cup. Iniesta and his teammates celebrate winning the UEFA Euro 2012. ^ "Barcelona profile". Fcbarcelona.com. Archived from the original on 13 September 2013. Retrieved 23 June 2012. ^ "Andrés Iniesta, most successful Spanish player in history". RFEF. 21 December 2015. Retrieved 21 December 2015. ^ a b "Iniesta pips Messi and Ronaldo to UEFA Best Player in Europe award - CNN.com". CNN. 31 August 2012. ^ a b Rice, Simon (9 January 2013). "Fifa Ballon d'Or: Andres Iniesta and the best players never to win the award". The Independent. London. ^ a b "Guillem Balague debates whether Barcelona star Andres Iniesta is better than former Real Madrid man Zinedine Zidane". Sky Sports. 18 February 2013. ^ "Iniesta: the Spanish matador", 28 October 2003, FIFA.com. ^ Brown, Lucas (27 October 2008). "Madrid Red Light Let Iniesta Leave For Barça", goal.com. Retrieved 22 December 2010. ^ a b c Lowe, Sid (24 May 2009). "Iniesta graduates from cameo role to take centre stage at Barcelona", The Guardian. Retrieved 22 December 2010. ^ Stevenson, Jonathan (12 July 2010). "Andres Iniesta, the unassuming superstar", BBC Sport. Retrieved 22 December 2010. ^ a b "Andrés Iniesta". Soccernet.espn.go.com. Retrieved 23 June 2012. ^ "Iniesta, Barcelona's quiet man", 7 November 2006, FIFA.com. Retrieved 22 December 2010. ^ "Barcelona 2–1 Arsenal", 17 May 2006, BBC Sport. Retrieved 23 December 2010. ^ "Andres Iniesta". Fc.barcelona.com. Archived from the original on 29 November 2010. Retrieved 23 June 2012. ^ "Pre-Madrid renewal nothing new to Iniesta". Fcbarcelona.com. Archived from the original on 23 January 2013. Retrieved 23 June 2012. ^ Leong, KS (5 June 2009). "Barcelona Set To Extend Puyol's Stay & Improve Iniesta's Contract", goal.com . Retrieved 23 December 2010. ^ donbalon.com. "Ranking db 2006–2007". Archived from the original on 6 November 2007. Retrieved 1 May 2007. ^ www.donbalon.com. "Ranking DB 07-08". Archived from the original on 6 November 2007. Retrieved 1 May 2008. ^ fifa.com. "FIFA World Player Gala 2008" (PDF). Archived (PDF) from the original on 26 January 2009. Retrieved 10 January 2009. ^ "Four home-grown captains". Fcbarcelona.com. 23 September 2008. Archived from the original on 22 January 2013. Retrieved 23 June 2012. ^ Goal.com. "Player Ratings: Almeria 0–2 Barcelona". Archived from the original on 17 March 2009. Retrieved 15 March 2009. ^ Goal.com. "Iniesta Enjoys Barcelona Return Against Mallorca". Archived from the original on 6 January 2009. Retrieved 4 January 2008. ^ Matt Lawton (25 April 2009). "Samuel Eto'o exclusive: Sign for a team from England? Why would I quit the best?". Daily Mail. London. Retrieved 17 June 2010. ^ McNulty, Phil (6 May 2009). "Chelsea 1–1 Barcelona (agg 1–1)", BBC Sport. Retrieved 22 December 2010. ^ Hawkey, Ian (29 November 2009). "Andres Iniesta: 'Don't call me Rambo'", The Times. Retrieved 22 December 2010. ^ McCarra, Kevin (27 May 2009). "Manchester United fold without a fight as Barcelona claim Champions League", The Guardian. Retrieved 22 December 2010. ^ Pleat, David (28 May 2009). "Middle men to the fore in dictating the rhythm with care", The Guardian. Retrieved 22 December 2010. ^ Mole, Giles (28 May 2009). ""Manchester United v Barcelona: Wayne Rooney backs Andres Iniesta for Ballon d'Or", The Daily Telegraph. Retrieved 22 December 2010. ^ "Lionel Messi Wins FIFA World Player of the Year Award". Goal.com. 22 December 2009. Archived from the original on 16 January 2010. Retrieved 22 December 2009. ^ "Classement 2009". France Football (in French). Groupe Amaury. Archived from the original on 16 November 2012. Retrieved 10 January 2013. ^ "FCBarcelona.cat". 29 July 2012. Archived from the original on 29 July 2012. ^ "Iniesta: "No me veo para jugar 90 minutos"". RTVE.es. 10 September 2009. Retrieved 17 June 2010. ^ Andrés Iniesta (11 May 1984). "Andrés Luján Iniesta Profile, Statistics, News, Game Log – Barcelona, Spanish Primera División – ESPN Soccernet". ESPN. Retrieved 17 June 2010. ^ "FCBarcelona.cat". Fcbarcelona.com. 13 April 2010. Archived from the original on 16 June 2010. Retrieved 17 June 2010. ^ Lowe, Sid (6 September 2016). "Barcelona's Andrés Iniesta: 'I was a victim of something that terrified me'". The Guardian. Retrieved 7 September 2016. ^ a b "Iniesta: "My objectives are collective"". Fcbarcelona.cat. Archived from the original on 15 January 2013. Retrieved 23 June 2012. ^ "Andres Iniesta's Volley vs Racing Santander". The Offside. 30 August 2010. Archived from the original on 24 March 2012. Retrieved 23 June 2012. ^ "Player Ratings: Atletico Madrid 1–2 Barcelona". Goal.com. 19 September 2010. Retrieved 23 June 2012. ^ "SPORT". Sport.es. Retrieved 23 June 2012. ^ "Lionel Messi, Xavi and Andrés Iniesta shortlisted for Ballon d'Or", The Guardian, 6 December 2010. Retrieved 13 December 2010. ^ Philip Mboya (18 March 2012). "Iniesta Equals Butragueno's 50 Match Unbeaten Streak". Soccerticketsonline.com. Retrieved 23 June 2012. ^ "Levante 0–4 Barcelona Match Report". Goal. (25 November 2012). Retrieved 25 November 2012. ^ "Messi, Ronaldo and Iniesta named on 2012 FIFA Ballon d'Or shortlist", , 29 November 2012. Retrieved 29 November 2012. ^ "Rosell announces new Iniesta contract until 2018". FC Barcelona. 19 December 2013. Retrieved 19 December 2013. ^ "8 Andrés Iniesta". Fox Sports. Retrieved 7 June 2015. ^ "Real Madrid Fans Applaud Barcelona's Andres Iniesta In 'El Clasico'". NESN. 21 November 2015. Retrieved 22 November 2015. ^ "Real Madrid 0 - 4 Barcelona Player & Team ratings - 11/21/15 Primera División - Goal.com". www.goal.com. 21 November 2015. Retrieved 22 November 2015. ^ "Andrés Iniesta signs lifetime contract with FC Barcelona | FC Barcelona". FC Barcelona. Retrieved 6 October 2017. ^ "Barcelona vs Levante". ESPN. Retrieved 7 January 2017. ^ Sport (27 April 2018). ""Este club se merece lo mejor de mí y yo ya no podría dárselo"". sport (in Spanish). Retrieved 27 April 2018. ^ Sam Marsden (20 May 2018). "Andres Iniesta 7/10 in final Barcelona game, a 1-0 win vs. Real Sociedad". ESPN FC. Retrieved 21 May 2018. ^ "Andrés Iniesta to Join Vissel Kobe". vissel-kobe.co.jp. 24 May 2018. Retrieved 24 May 2018. ^ "Andres Iniesta and Fernando Torres lose on J-League debuts". BBC. 22 July 2018. Retrieved 22 July 2018. ^ "FIFA U-17 World Championship Trinidad and Tobago 2001". FIFA.com. Retrieved 15 October 2015. ^ a b "Andres INIESTA". FIFA. Retrieved 18 June 2014. ^ (AFP) – 5 June 2009 (5 June 2009). "Injured Iniesta to miss Confederations Cup". Google. Retrieved 17 June 2010. ^ Smith, Rory (25 June 2010). "Chile 1 Spain 2: match report". London: telegarph.co.uk. Archived from the original on 28 June 2010. Retrieved 25 June 2010. ^ "Forlan collects Golden Ball award". BBC News. 11 July 2010. ^ "Iniesta sinks Dutch with late strike". ESPN Soccernet. ^ "World Cup final: Spain goal scorer Andres Iniesta pays tribute to Dani Jarque with t-shirt". The Daily Telegraph. Retrieved 9 October 2018. ^ Jones, Grahame (11 July 2010). "Spain's Little Man Comes Through in the Biggest Moment". Los Angeles Times. Archived from the original on 15 July 2010. Retrieved 13 July 2010. ^ Jonathan Stevenson. "Andres Iniesta, the unassuming superstar". Bbc.co.uk. Retrieved 23 June 2012. ^ Lyttleton, Ben. "Spain earns the big prize, but here are my Euro 2012 tourney awards". Sports Illustrated. Retrieved 7 January 2012. ^ "UEFA EURO 2012 Team of the Tournament". uefa.com. Retrieved 2 July 2012. ^ "Neymar wins Confed Cup Golden Ball". Fox Soccer. Retrieved 19 June 2014. ^ "World Cup 2014: Socceroos lose 3–0 to Spain in final game as valiant campaign comes to an end". Australian Broadcasting Corporation. 24 June 2014. ^ "Player ratings: Andres Iniesta shines in Spain's midfield". The Independent. 13 June 2016. Retrieved 15 June 2016. ^ "Spain's World Cup hero Andres Iniesta retires from international football after penalty defeat by Russia". The Independent. 1 July 2018. Retrieved 1 July 2018. ^ Corrigan, Dermot (1 July 2018). "Andres Iniesta confirms retirement from Spain squad after World Cup exit". ESPN. Retrieved 14 December 2018. ^ FCBarcelona.cat. "Andrés Iniesta Lujan". Archived from the original on 9 March 2009. Retrieved 17 March 2009. ^ "2010 FIFA World Cup™ – Andres INIESTA". FIFA.com. Archived from the original on 12 November 2012. Retrieved 23 June 2012. ^ "The best 'croquetas' in world football". Marca. Retrieved 3 August 2018. ^ "World Player of the Week: Andrés Iniesta – Spain". Goal.com. 12 July 2010. Retrieved 23 June 2012. ^ "''El caballero pálido de Fuentealbilla''". Elperiodico.com. Retrieved 23 June 2012. ^ "Now sublime Iniesta has reached the ZZ top after an incredible Euro 2012". Daily Mail. London. ^ "FIFA 19 release: Champions League, new ICONs & 19 reasons to get excited for new game". Goal. Retrieved 12 September 2018. ^ "Cristiano Ronaldo overtakes Shakira as Facebook's most 'liked' person". Yahoo.com. 10 February 2017. ^ Embury-dennis, Tom (15 March 2015). "Cristiano Ronaldo goes top of the Facebook charts as Real Madrid star overtakes Shakira to become most liked person". Daily Mail. Retrieved 7 April 2015. ^ "Iniesta caps Euro 2012 winning week with wedding". San Francisco Chronicle. Retrieved 8 July 2012. ^ "Happy times: Andres Iniesta and Anna Ortiz have a second child!". Sport. 1 June 2015. Retrieved 7 September 2016. ^ Cabezas, Francisco (23 September 2016). "El sueño de Iniesta". El Mundo (in Spanish). Retrieved 23 September 2016. ^ "Soccer player who scored winning World Cup goal promises to make pilgrimage". Catholic News Agency. 14 July 2010. ^ Ciriza, A. (6 December 2011). "Iniesta throws 420,000-euro lifeline to indebted Albacete". El País. Retrieved 13 May 2014. ^ "Iniesta loans Albacete 240,000 euros to prevent relegation". as.com. EFE. 28 June 2013. Retrieved 13 May 2014. ^ "Andrés Iniesta conmueve a todos hablando de cómo salió de "pozo" en el que cayó". Lecturas (in Spanish). RBA. 28 May 2018. Retrieved 7 June 2018. ^ "Andrés Iniesta confiesa a Risto Mejide que sufrió una depresión antes de ir al Mundial". Hola! (in Spanish). 28 May 2018. Retrieved 7 June 2018. ^ Andrés Iniesta at Soccerway. Retrieved 27 January 2018. ^ "Andrés Iniesta – national football team player". EU-Football.info. Retrieved 25 March 2018. ^ a b "Iniesta, Andrés". National Football Teams. Benjamin Strack-Zimmerman. Retrieved 25 March 2018. ^ "Andrés Iniesta: Achievements". FC Barcelona. Retrieved 27 May 2017. ^ a b c "Iniesta Profile". UEFA.com. Retrieved 24 October 2017. ^ "FIFA FIFPro World11". FIFA.com. Fédération Internationale de Football Association. 24 October 2017. Retrieved 24 October 2017. 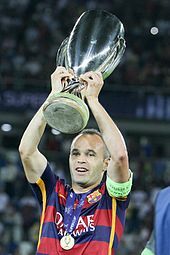 ^ "Iniesta claims UEFA Best Player in Europe Award". uefa.com. Retrieved 1 January 2016. ^ "Iniesta named Best Player of the Tournament". uefa.com. 2 July 2012. Retrieved 1 January 2016. ^ "Andrés Iniesta wins Golden Foot 2014". FC Barcelona. 13 October 2014. Retrieved 13 October 2014. ^ "2015 FIFA Club World Cup awards". Fédération Internationale de Football Association. Archived from the original on 12 January 2016. Retrieved 20 December 2015. ^ "Messi, Neymar Jr, Iniesta and Alves in France Football world XI of 2015". FCBarcelona.com. 30 December 2015. Retrieved 30 December 2015. ^ "The 2015/16 Liga BBVA Team of the Season". LFP. 1 June 2016. Retrieved 4 June 2016. ^ "Prince of Asturias Awards 2010". ^ "Royal Order of Sporting Merit 2011". ^ "Andrés Iniesta collects Queen Sofia Award in Madrid". FCBarcelona.com. Retrieved 24 January 2017. ^ "Iniesta awarded Grand Cross of the Royal Order of Sports Merit in Spain". www.efe.com. Retrieved 5 June 2018. Wikimedia Commons has media related to Andrés Iniesta.